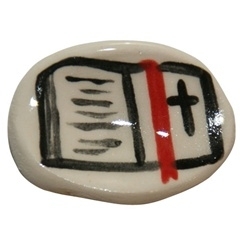 This individually hand-crafted Bible Stone is made of durable glazed pottery which can last a lifetime. At about 1.5 inches, it is sized to fit in a pocket, blessing bowl, or a faith chest. Purchase one or more to gift to others as a meaningful reminder of this milestone. This stone complements the Bible Milestone Module. It is also included in the Blessing Bowl set for Congregational Milestones. As one of our Baptismal promises, parents commit to bring the Word of God to their children. It is a significant time in our children's faith journey and worthy of celebrating as it marks the presentation of the first personal Bible to a child. It is an opportunity for congregational members, parents, guardians, and other caring adults to encourage children in understanding the importance of using, reading, and studying the Bible for the rest of their lives. This Bible stone for gifting is a wonderful keepsake to remember this special celebration as children receive their first Bible.